1. Halberg Chronobiology Center, University of Minnesota, Minneapolis, MN, USA.2. DiagnosTechs, Kent, WA, USA.3. Institute of HeartMath, Boulder Creek, CA, USA.4. National Institute of Child Health and Human Development, National Institutes of Health, Bethesda, MD, USA. Recurrent half-yearly adynamia was experienced by JF (62 years [y]) for the preceding 20 y, Table 1. 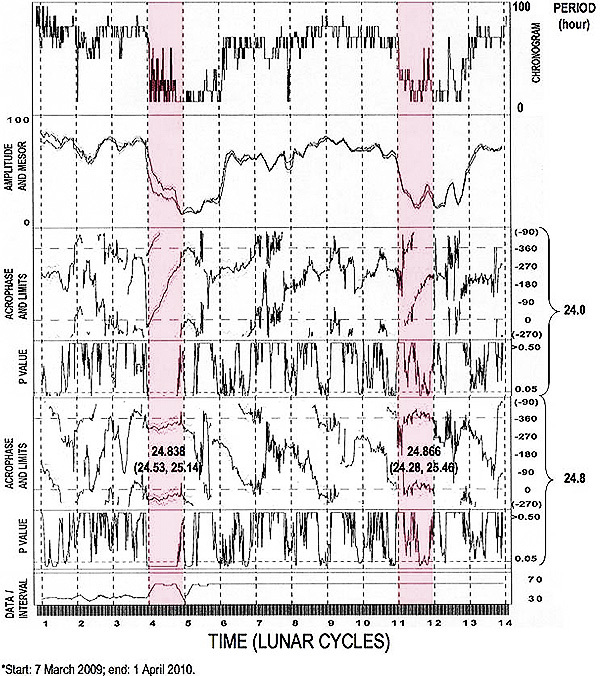 In each of the last 2 episodes, summer 2009 and winter 2009-10, she had circadian desynchronization from the societal routine of her ~3-hourly vigor ratings with initial lunar cycle synchronization, Figure 1, while in the second lunar month of the adynamic episode and in both months in winter, the systolic (S) and diastolic (D) blood pressure (BP) and heart rate were also desynchronized. JF further rated her daily general well-being, as did her 42-y-old daughter, FT, who also observed the 4-y-old granddaughter, LT. A "normal" day rated 3, better higher and worse lower, sometimes with fractionated numbers and extremes as 1 and 5. LT’s lower numbers were associated with non-typical hyperactivity, more energy and talkativeness, and resistance to parental guidance; her higher numbers indicated self-discipline, obedience and progress in learning. Not unexpectedly, ratings of mother FT and her daughter LT were correlated (r=0.436; P<0.01), as were those of JF and her daughter FT, who lived separately most of the time (0.213; P<0.01), but not those of JF and her granddaughter LT (r=0.084). It was the more surprising that in linear-nonlinear spectra of daily ratings of well-being by the extended cosinor, JF and LT, but not FT, showed a cis-halfyear, if we define the latter as a spectral component with a period, f, that has a CI (95% confidence interval) overlapping 0.40 to 0.42 y. LT had a f = 0.37 y (0.28-0.45 y) and JF a f = 0.38 y (0.34-0.41 y), with Marquardt’s conservative approach. About 154-day f s are amply described in solar activity, notably flares (1), and in sudden cardiac deaths and cardiac arrhythmias in some but not all geographic locations; in Minnesota (2) and Tokyo (3), nonphotic cycles (transyears) replaced the photic year. FT and LT have f of 26 days (d) (24.1-27.9 d) shorter than JF’s 29.1d (27.4-30.9). These results are qualified by the relative brevity of daily ratings from 20091101 to 20100518, yet are in keeping with the proposition of a possible familial basis in JF, but not yet expressed in FT or LT, of a case of recurrent half-yearly adynamia with circadian desynchronization of the blood circulation, salivary cortisol and DHEA and initial transient lunar synchronization of vigor (4). Start-end dates, lunar phase (f: date of full moon; n: date of new moon) and length (weeks) of spans of adynamia when recorded in winter (W) and summer (S). Rieger E et al. A 154-day periodicity in the occurrence of hard solar flares? Nature 1984; 312: 623-625. Halberg F et al. Chronobiology’s progress: season’s appreciations 2004-2005. Time-, frequency-, phase-, variable-, individual-, age-and site-specific chronomics. J Applied Biomedicine 2006; 4: 1-38. http://www.zsf.jcu.cz/vyzkum/jab/4_1/halberg.pdf. Cornélissen G et al. A cis-half-year characterizes the incidence of sudden cardiac death also in and near Austria. In: Proceedings, International Symposium, Problems of ecological and physiological adaptation, People’s Friendship University of Russia, Moscow, 30-31 Jan 2007. Moscow: People’s Friendship University of Russia; 2007. p. 545-551. Halberg F, Cornélissen G, Finley J, Thomas F, Ilyia E, McCraty R, Hillman D. Variability disorder: recurrent adynamia with lengthened circadian cortisol, DHEA, blood pressure, pulse and vigor cycles. This volume. Start: 7 March 2009; end: 1 April 2010.